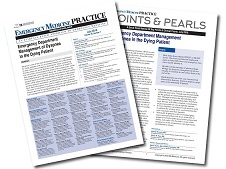 Specialty CME Credits:: Included as part of the 4 credits, this CME activity is eligible for 2 Ethics CME, 2 Palliative Care CME, 2 End-of-Life Care CME, and 1 Pharmacology CME credits, subject to your state and institutional approval. After reading this, I will initiate opioids for dyspnea early on in the care of the dying patient and not just for pain relief. I will use NIPPV as an option for dyspnea for hospice patients. 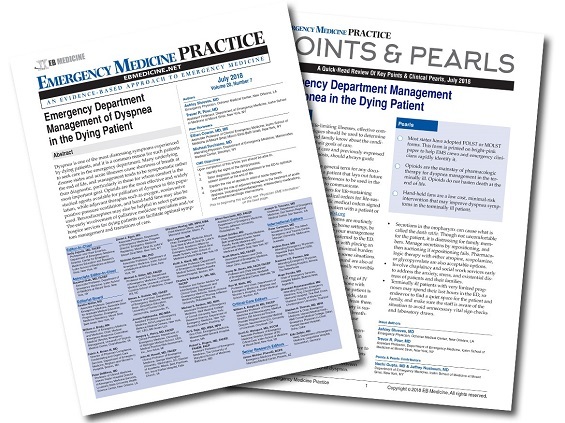 I'll make several changes to my practice as a result of this article: improved end of life care in the emergency department; improved efforts with communication and POLST identification; improved symptom care for the dyspnic patient in the ED. This article was a long time coming regardless of state CME requirements. In residency we learned how to sensitively convey the death of a patient but never really focused on the dying process. I'm embarrassed to say in 25 years of practice i never thought to ask "What's most important [to you]?" It's also a reminder of what the pre-hospital people face with limited information. Excellent review. Should be required reading. One of the most engaging and sincere CMEs I've ever done. Very eye opening to what we are actually here for and the need to align our goals with the patients and family. Please let the authors know great job and they are making a difference. This course was an eye opener... never thought about palliative care before... and opiates for SOB seemed counterintuitive.. thanks! This issue discussed an important and increasingly prevalent clinical problem which is not often well handled in the ED. The knowledge presented will help clinicians provide better care to these distressed (and distressing) patients. I will approach the dying patient with more confidence that I can support them appropriately with judicious interventions that will make them more comfortable while not prolonging their suffering.